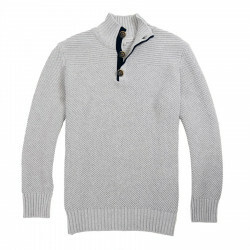 Lovely grey sweater, high collar, seed stitched and rib cuffs finish. Nice heavy grey sweater, seed stitched. The top of the sweater is stitched laterally. This sweater is warm, pleasant to wear, plain and elegant. The finish on cuffs, collar and bottom is ribbed.